Auto Foreign Services was started in 1962 by my father Albert Linden. In the late 50's he went to Europe to visit relatives and would buy a new VW Beetle and bring it back with him... and found that he could sell his essentially new car for a profit. He worked to develop contacts in the car industry and ended up working with Ben Pon. Ben Pon was a Porsche factory race driver who ultimately ended up with the distributorship in Holland for Porsche, VW, and several other makes. Looking for additional distribution, Mr. Pon was willing to sell new cars "wholesale" to distributors in other countries. It was through this relationship with Mr. Pon's company that my father started Auto Foreign Services. My father began by taking orders for US delivery of VW's, Porsche's, Mercedes and other makes as well. Subsequently he also added European Delivery as part of his services, so you could take delivery of your new car at the Factory, drive it through Europe and then have it shipped back to the USA. Many Porsche's were imported to the USA by customers of Auto Foreign services from 1962 through to the mid 1980's. The option list for European vehicles was usually more substantial than the USA dealers offered, and you could customize your car order pretty much as you wished. 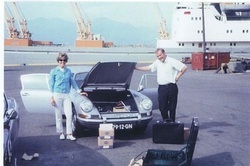 At the top of this page is a picture of a very heavily optioned European Model Porsche 1968 911L being delivered new on the docks up in Vancouver BC. My father ordered this car new for a customer (New owner Rosie is pictured on the left, her husband Don is not pictured), my father is on the right. The car was purchased with the very rare rally option #9552, and has the 901/30 engine in it, and a 901/52 "airport" gearbox. Only 28 cars were built to this standard by the factory and all of the others were used for racing Trans-Am in the USA, and rallying in Europe. My father is on the right in the picture. After many years of looking, we have just found and purchased this car, look for the pictures of a partial restoration on our website coming soon! I have restarted my fathers company with the intent of bringing fine NOS, rare, and perfectly reproduced accessory items for both Early 911's and 356 Porsches. After many years of collecting both cars and parts I have decided to dedicate my full time to this hobby. Though the offerings are limited at this time, I will be adding new parts monthly to this website and I hope you come back on a regular basis to see the new items!